The Annual Concert and Prize Day of the Junior School (Nursery to Class 1) of Boys’ High School and College was held in the beautifully decorated Middle School Hall on Saturday. On this pleasant day, the Boys’ High School and College family felicitated the academic heroes of the Junior School. The Principal, Mr. D. A. Luke graced the occasion as the chief guest. 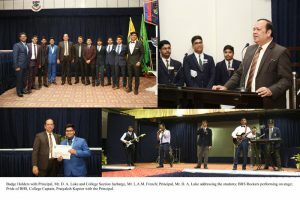 The Annual Concert and Prize Day of the Junior School (Class II to VI) of Boys’ High School and College was held in beautifully decorated Middle School Hall on Saturday. Mr. V. S. Datta, Resident Editor, Northern India Patrika was the chief guest on this occasion. The Annual Prize Day function of Boys’ High School and College was held in the Middle School Hall on Friday. Prof Yogeshwar Tewari, Head of the Department of Medieval and Modern History, University of Allahabad was the chief guest on this occasion. Nearly 200 proud winners from class 6 to class 12 were felicitated for their excellence in academics, sports and games. The atmosphere inside the hall turned nostalgic as the formally dressed young gentlemen entered the hall amidst clapping and cheering. The hall reverberated with excitement and anticipation as the captains of the four Houses, walked with pride and honour for one last time. College Captain, Pratyaksh Kapoor led the four house captains to handover the flags to the Principal, Mr. D. A. Luke.